Students quickly read phrases on cards to help practice fluency skills. The phrases are leveled and contain sight words from the Fry Second Grade Instant Word Lists. Repeated readings of a few phrases per day or week give students practice reading high-frequency words and developing fluency and general proficiency. 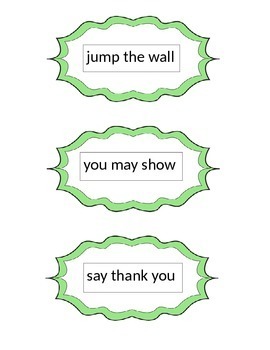 Can be used with a buddy or independently during class literacy time. Preparation is simple: print, laminate, cut apart, and put on a binder ring. Includes a recording sheet for timed activities.